Canis rufus, the controversial red wolf of North America. Photo from Steven Hoelzer. Despite the fact that I've been posting on this site for nearly two years now, I think this is just about a first - I'm actually going to write about something I've said I was going to write about. I'd better not let it become a habit - people might begin to think that I'm reliable. 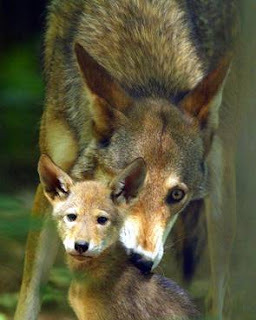 In the post just linked to, I considered writing on "the taxonomy of dingoes and singing dogs, and of the wolf complex in general, [and] the origins of the red wolf (and how the ICZN fumbles on hybrids)". This is that post. To write about the wolf complex, though, first I'll have to define it. The phylogenetic analysis of Bardeleben et al. 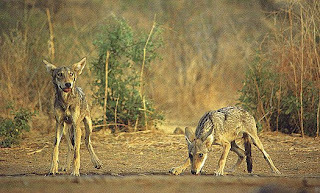 (2005) found a primary division of the genus Canis between the side-striped (Canis adustus) and black-backed (Canis mesomelas) jackals on one hand, and a clade containing the golden jackal (Canis aureus), coyote (Canis latrans), wolf (Canis lupus) and domestic dog (Canis familiaris) on the other. This latter clade was also supported by Zrzavý & Řičánková (2004), who also included therein Canis simensis, the Simien jackal or Ethiopian wolf. These five species, therefore, can be referred to as the wolf complex (or Canis 'sensu stricto', if one were to accept Zrzavý & Řičánková's suggestion of moving the other two species to separate genera, but I don't know of anyone who has). Relationships within the clade are not yet clearly resolved. 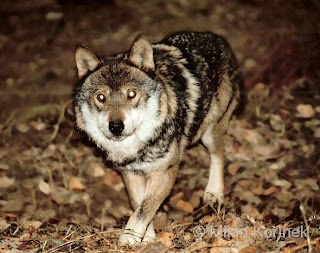 The Indian wolf, Canis pallipes, one of the "subspecies" of Canis lupus that has been regarded as a separate species in recent years. Photo by Rajpal Singh. Though the four main species of Canis aureus, C. lupus, C. latrans and C. simensis all seem to be safe enough, beyond this it all becomes hazy*. At their broadest circumscriptions, three of the four species are extremely polytypic. Mech (1974) listed thirty-two subspecies for Canis lupus, Bekoff (1977) gave nineteen for Canis latrans, and while I haven't found a full listing of subspecies for Canis aureus, I think it's safe to say that there's a few. Even C. simensis manages to fit in two subspecies (Sillero-Zubiri & Gottelli, 1994), despite having a distribution not much larger than a cereal box (the two subspecies are divided by a minor geographical hiccup known as the Rift Valley). 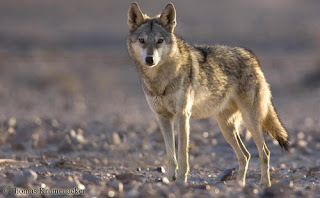 Needless to say, a number of these "subspecies" have been recognised as distinct species at one time or another, particularly various wolf populations such as the eastern North American Canis lycaon, the Indian C. pallipes or the Japanese C. hodophilax. The North African C. lupaster doesn't seem to be clamouring for separate species status, but authors disagree whether it's a subspecies of C. aureus or C. lupus. And yes, this is one of those "species concept" things - all members of the wolf clade seem to be pretty much fully interfertile, though behavioral differences may slow down cross-breeding where species overlap. *It occurs to me that this line is becoming something of a cliché for this site. Honestly, is there any group of organisms out there for which the taxonomy is not hazy? The Egyptian Canis lupaster, the one that doesn't know if he's a wolf or a jackal. Photo by Thomas Krumenacker. The most hotly contested issue of interfertility in the wolf clade is undoubtedly that involving 'Canis rufus', the red wolf. The name 'Canis rufus'* has been applied to a form of Canis once found over a large part of the south-eastern United States, from Texas to Florida (Paradiso & Nowak, 1972), but which became extinct in the wild by 1980, before a re-introduced population was established from captive animals in North Carolina in the late 1980s. However, numerous authors have made the suggestion that C. rufus is not a valid 'species', but represents a hybrid between C. lupus (or C. lycaon) and C. latrans (Brownlow, 1996). As 'pure' red wolves became fewer and further between, hybridisation with coyotes became common, further muddying the waters. *Older references use the name Canis niger, originally applied to the now-extinct Florida red wolf (Canis rufus floridanus). While niger is the older name by some sixty years, the book that it was published in, the Travels of W. Bartram, was declared by the ICZN to be invalid for the purposes of nomenclature, so the next-oldest name swings into use. The original Canis lupus lupus. The species status of this one, at least, is safe. Photo by Milan Kořínek. The red wolf was perhaps the academic victim of two malign influences - an unjustified preconception about how speciation works, and the ability of politics to interfere with scientific inference. While no law explicitly states as much (Brownlow, 1996), the general policy for conservation in the United States (and, for that matter, most other places in the world) has been that "hybrids" aren't worth conserving. Instead, there is generally a focus on maintaining "pure" lineages that is sometimes at odds with reality. Also, hybridisation has generally been assumed to be of little importance in animal evolution. The stereotypical view that hybrids between species are infertile (not the case with members of the wolf clade) means that hybrids are assumed to be dead-end oddities. Even the ICZN previously regarded names based on hybrids as invalid, and while this rule was most likely introduced to prevent names based on one-off, individual hybrid specimens (such as a mule), it was also invoked to declare names for populations of hybrid origin to be invalid (the current Code has changed the rules somewhat to remove this ambiguity). This is in stark contrast to the situation in botany, where hybridisation has long been recognised as a major player in the origin of new species, and where the Botanical Code of Nomenclature even has a specific concept of "nothospecies" for taxa of hybrid origin. As a result, the debate over the red wolf became unnecessarily polarised into an argument over whether it was of hybrid origin or a valid species - the possibility that it could be both seems to have never entered consideration. The taxonomy of the wolf clade is further confused, of course, by the question of how to deal with domestic dogs and their wild derivatives. I'll refer you to a post by Darren Naish from a couple of years ago on the question of domestic dog origins. Darren refers in that post to the pariah dogs - wild populations of generalised domestic dog-type that are found from southern Asia to Australia, where, of course, they are represented by the dingo. The New Guinea singing dog, Canis hallstromi (sometimes). Photo by Patti McNeal. 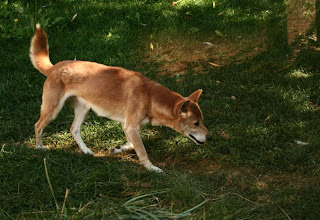 There is no doubt that populations such as the dingo and the New Guinea singing dog are ultimately derived from dogs that arrived in Australasia with the original human settlers. On this basis, the majority of authors have tended to include them with with domestic dogs as Canis familiaris and Canis lupus familiaris. However, these dogs have been living wild in their respective countries for a very long time, and have become morphologically distinct from their ancestors, leading others to separate them as the species Canis dingo and Canis hallstromi (Koler-Matznick et al., 2003)*. Again, the difference seems to be more one of philosophical approaches to what should be regarded as a "species", with a soupçon of the artificial distinction between "natural" and "altered" conditions. How long does it take for a "feral" population to become a "wild" one? *One further point (which I'm putting in a footnote because I couldn't work out how to integrate it into the paragraph) is that these dogs quite possibly became part of the "wild" environment very soon after their arrival with humans, if not immediately (and while there's a lot of disagreement about when exactly that was, it was at least many tens of thousands of years ago). After all, the modern intensive management of domestic animals did not always apply - in many cases, animals were largely left to roam free, dogs especially so, and their presence was more encouraged than controlled. The dogs that originally arrived in New Guinea and Australia could have been more commensals than domesticates of humans. Bekoff, M. 1977. Canis latrans. Mammalian Species 79: 1-9. Brownlow, C. A. 1996. Molecular taxonomy and the conservation of the red wolf and other endangered carnivores. Conservation Biology 10 (2): 390-396. Koler-Matznick, J., I. L. Brisbin Jr, M. Feinstein & S. Bulmer. 2003. An updated description of the New Guinea singing dog (Canis hallstromi, Troughton 1957). Journal of Zoology 261: 109-118. Mech, L. D. 1974. Canis lupus. Mammalian Species 37: 1-6. Paradiso, J. L., & R. M. Nowak. 1972. Canis rufus. Mammalian Species 22: 1-4. Sillero-Zubiri, C., & D. Gottelli. 1994. Canis simensis. Mammalian Species 485: 1-6. Zrzavý, J., & V. Řičánková. 2004. Phylogeny of Recent Canidae (Mammalia, Carnivora): relative reliability and utility of morphological and molecular datasets. Zoologica Scripta 33 (4): 311-333. Great post, Christopher. The differing attitudes toward hybridization’s role in evolution between botany and zoology is one of those obvious-but-never-occurred-to-me points till I read it here. Thanks. You seem to be saying they're really all just mutts, more or less. (As a cat person, I'm inclined to agree, to the point of being willing to put words in your mouth.) These minimally variant breeds of a super-species Canis universalis, collectively, have been remarkably successful, and only partly by symbiosis with Homo. Considering the difference between a pekingese and a mastiff, aren't the diagnostic differences between the nominal species you mention rather fussy? Or are all skeletal features retained among all C. familiaris breeds (however distorted), but lost or innovated in the wild populations? Watcher; yes, the differences in attitude between botany and zoology towards hybridisation is just one of the reasons why, while zoologists whole-heartedly embraced the Biological Species Concept, botanists have generally regarded it as something of a poor joke. You seem to be saying they're really all just mutts, more or less. I'm not sure I'd put it quite like that, but that's certainly one way of looking at it. It's not so much that they're "minimally variant", it's that the lines between them are far from clear. Considering the difference between a pekingese and a mastiff, aren't the diagnostic differences between the nominal species you mention rather fussy? And that, of course, is one of the reasons why domesticated animals are so difficult to deal with taxonomically. Human breeding has ramped up the level of variation between populations (or subpopulations), but human intervention is required to maintain that variation. So what should we do? As regards the wild taxa, the question isn't so much how fine the distinctions are, it's whether the distinctions are fixed between the populations. A single widespread species may encompass more variation overall than a number of very restricted-range species. all I have to say is this: Fascinating!